Whippet activities are as varied as the Whippets themselves. The breed is made to be versatile, and owners are forever finding new venues, arenas and areas of interest where Whippets can excel, or at the very least, really enjoy participating. So, with such a long list of things that Whippets CAN do, it would be best to start with a short list of the activities for which they are not, by nature or by conformation, well-suited. 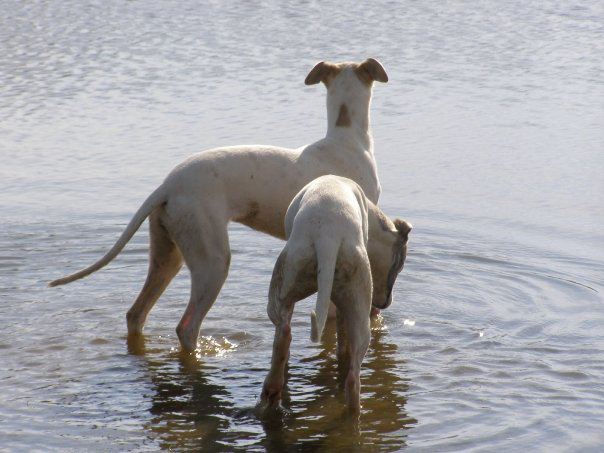 Whippets are not naturally as buoyant as the water retrieving breeds, having low body fat, slender legs and smaller feet, and no insulating, oily coat to protect them from cold water, so water retrieving is not one of the activities that Whippets are suited to do. However, a few Whippets have tried the new sport of Dock Diving, and some have proven to be exceptional. But bear in mind, those dogs are not being asked to swim for long periods of time in cold water. Whippets are naturally inclined to be friendly and not suspicious of strangers, so protection and guard-oriented sports such as Schutzhund are not in their wheelhouse. While a few people have reported that their Whippets would bring in the sheep, the breed does not have the sort of herding instinct one would expect from a true herding breed. Whippets are sprinters, not marathon runners. While they are fine running companions for casual joggers and runners, there are endurance trotting breeds that make a better choice for someone who wants a dog to do ten miles a day with him as he preps for a marathon. While there are individual exceptions, the traditional forms of competition obedience require more repetition and precision than most Whippet trainers can achieve if they want to title and win at the highest levels of that sport. So, someone who is very serious about having an Obedience Trial Championship (OTCH) dog should probably consider a different breed. However, with modern methods of positive training, Whippets can and do earn obedience titles and often score quite well. The more recently introduced Rally obedience competition seems much better suited to the Whippet disposition, and many Whippet owners have taken to that activity enthusiastically, as have their dogs. So, what CAN your Whippet do? Well, Conformation Dog Showing, Lure coursing, Racing, Agility, Obedience, Flyball, Dock Diving, Disc sport, Tracking and Nosework are all activities that Whippets are enjoying today. What’s next for Whippets? The sky is the limit! 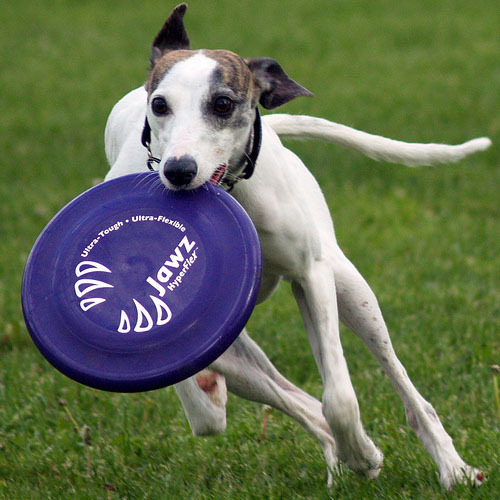 New dog sports are being invented all the time — and in many of these, the versatile, adaptable Whippet will surely make its mark. A very special activity that Whippets appear to be highly suited to take part in is Therapy Dog work. By both disposition and size, as well as their short coat, the Whippet is a very good breed to choose to train as a Therapy Dog. Whippets and their owners are active in nursing homes, cancer wards, and working with special education and handicapped children, and in the READ programs, where children practice their reading skills by reading to dogs. A privately sponsored award called The Willow Award, in honor of one of the most influential Whippet therapy dogs, is offered each year to the top nominated therapy Whippet and awarded at the AWC National. However, there are scores of unsung Whippet heroes active in their communities, bringing joy and comfort to people of all ages in need of a gentle, well-mannered canine visitor to snuggle with.